If you know my husband, you know he’s estate sale shopper. 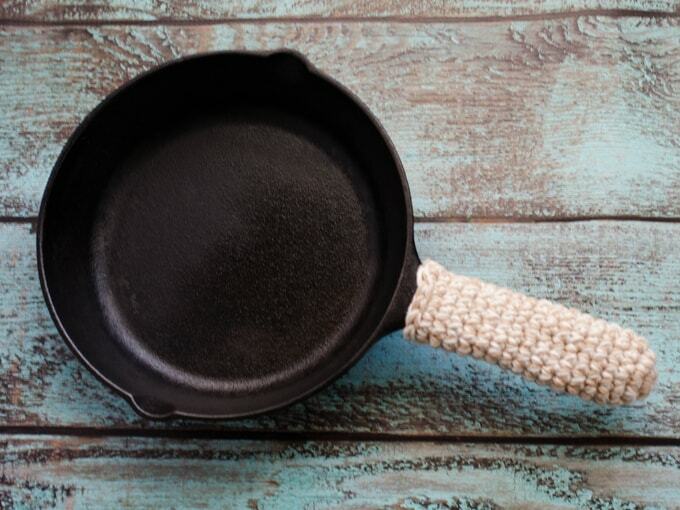 He loves a good deal and tops on his collection list are old cast iron skillets. He loves to bring them home, lovingly work off any rust spots and clean them to perfection. He also loves to cook with them and I think I have him convinced he is the only one in the household who can clean them to his standards. So often he’s on clean up duty too and I totally can live with that! When the cast iron gets hot, the whole thing gets hot, including the handle. Rather than grabbing the skillet with a potholder, I thought I could probably make something better. 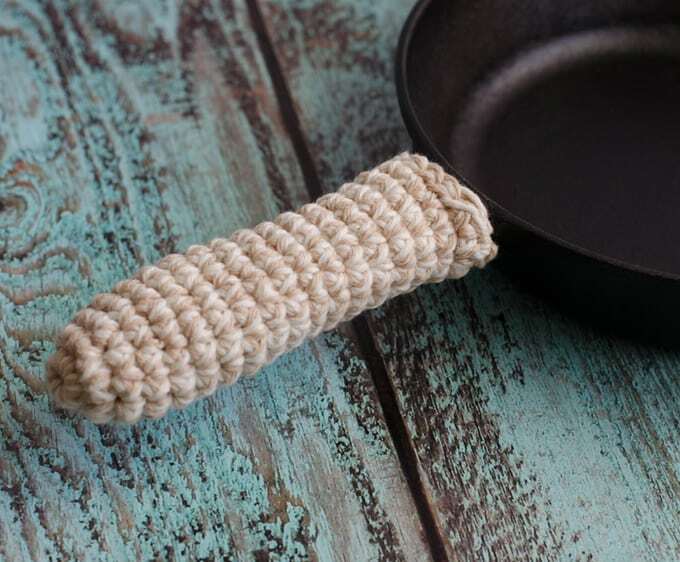 And so I designed a cast iron skillet handle cover and I’m sharing the pattern here with you. Just in case you want to keep your husband from burning himself. Worsted weight cotton yarn in 2 colors. I used tan and cream I had in my stash. Use a double thickness of yarn throughout project. I used 2 contrasting colors. You can also use a double thickness of the same color yarn. 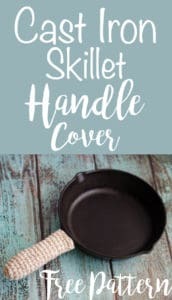 You want this cast iron skillet handle cover to be dense, without large holes and thick so it protects your hand. R1: Make a magic ring and sc 6. Work in the round. 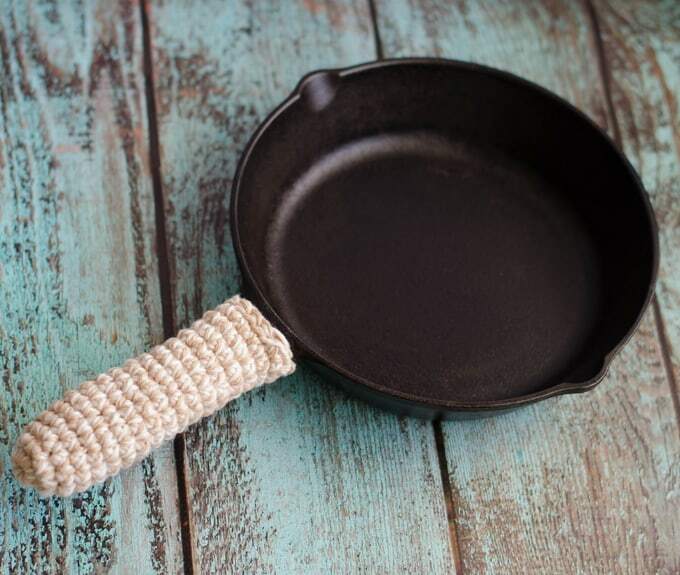 Easy peasy and in a flash your cast iron skillet handle protector is done! I’m making a few for some “extras” to stuff in his Christmas stocking. Shh.. don’t tell. We love to use cast iron! I’ve tried using 2 strands of cotton yarn (peaches and Creme) and it is stiff to me. Is there a secret to this? I moved up to an I hook and it’s tough getting each stitch complete. I admire you for making these bc I sure can’t. I can if I use one strand but then it’s not thick enough. Thanks for a great pattern, going to try to figure something out. Thanks! It is a bit stiff to crochet (but that nice thickness is what makes it good for protecting your hand from the heat). You could try a bigger hook and crocheting looser.